Come and join us for a trip down the water slide! On the way, youâ€™ll see a dragon protecting a castle and a penguin waddling across an iceberg. Listen and youâ€™ll hear the crazy rain cheering for the screaming wind, along with the fierce crackling of a bonfire as we roast gooey marshmallows for sâ€™mores. Feel the scorching sand underfoot as you stroll across a tropical island in the sun and brush your fingers over tiny soft kitties in a basket. Inhale the savory aroma of onion bread in a Taiwan night market and the thick, rustic smell of a chicken coop. Your mouth will water at the taste of sweet and sour lemon pies and freshly-baked cookies from Grandma. So enjoy your trip down the water slide â€“ but beware of monstrous bears, infamous wizards, and killer video game tanks. And whatever you do, watch out for that bull in the China shop! 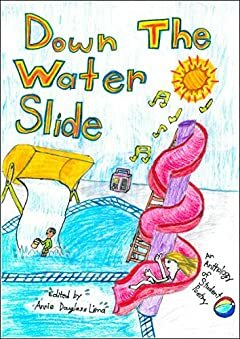 Created by fifth-grade students, Down the Water Slide features poetry in a variety of styles, from free verse to diamond poetry, acrostics, and haiku. Proceeds from the sale of this anthology will benefit Taichungâ€™s Pregnancy Support Center, a nonprofit organization dedicated to providing free services for women and babies in need. Learn more at http://pregnancysupport.tw/en/contact/.